Posted by Diya on Korea on 28 May 2014. I am sure you have all tried a burrito before. It is Mexican in origin, and is made up of a tortilla (tasty flour based flat bread) with rice, beans and usually meat wrapped inside. It takes a sheer genius to combine this with Korean food and even fuse the name to form KORRITO. It simply rolls off the the tongue and is very catchy. So what exactly is KORRITO, how does it work and where can we get our hands on it? 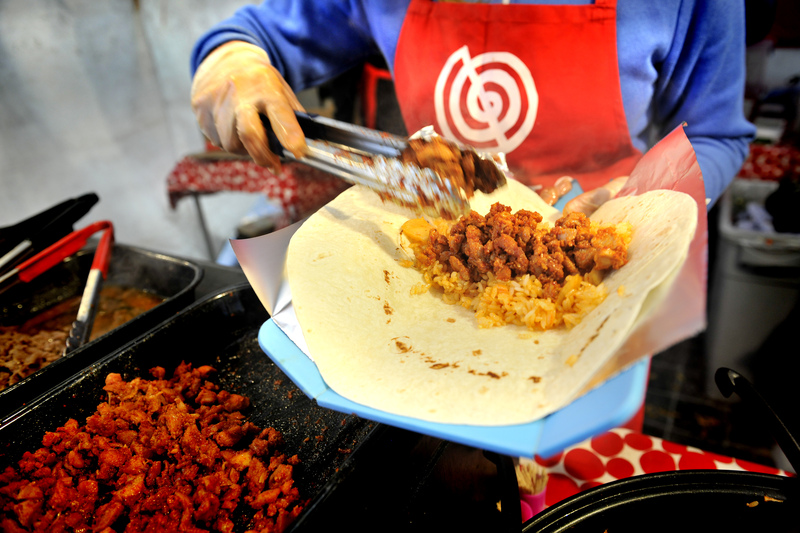 It is a food stall currently located behind Southbank Centre on Belvedere Road, serving Korean food in a burrito style way! STEP 1: You choose from three options, either a salad box, a burrito, or a rice box. STEP 2: You choose your filling. Spicy Pork Belly, Bulgogi Beef, or Buldak Chicken. STEP 3: you then have two options here to choose either plain steamed rice or kimchi rice. Simple, tasty filing and very good value for money. I tried my first Korrito burrito a few weeks ago at the Savouring Korea event, where I had the Buldak chicken and it was delicious. Sipping a cocktail Soju made with Aloe Vera, I comfortably watched the beautifully shot three part documentary series about Joo Lee the founder of KORRITO, her passion for Korean food and those involved in bringing Korean food to a wider audience. 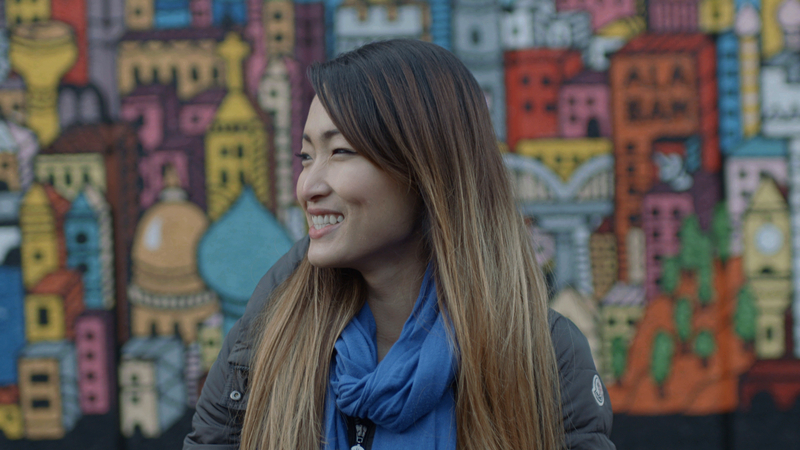 South Korean born Joo, moved to London with her family due to her father’s work at the tender age of three. Her family were only ever intending to stay on in the UK for a few years, but thankfully for us and the foodies of London, those few years turned into decades and Joo found herself growing up in London and subsequently studying in Oxford. She soon graduated and went into the corporate world working for an investment bank. She became inspired by the growing street food scene in London and by two of her colleagues who left their jobs to work in the food business that she decided to leave the corporate world and do just this herself! Following on from the Savouring Korea event and more recently the Urban Food Festival, I wanted to catch up with Joo and ask her a million questions about her passion. Thankfully I whittled them down to a few and Joo kindly answered them all for me. Why did you choose to fuse Korean and Mexican food? I was really inspired by the Korean food trend in the US, especially in LA. Back in the 1990’s, LA experienced a very unstable period that sparked the race riots. Fast-forward a couple of decades and it’s become a really dynamic, multicultural place, reflected in the new fusion food trends that have emerged. From that I took away that food can be the bridge that brings people together. It can open dialogues, it can even, in my mind, put a stop to conflict and feuding. Ultimately we all love good food. We all love that sense of being part of a community and that is humanistic in all of us. I was inspired by this story. I wanted to bring to London, the food that reflected this spiritually of bringing people together and also something that tasted really good. 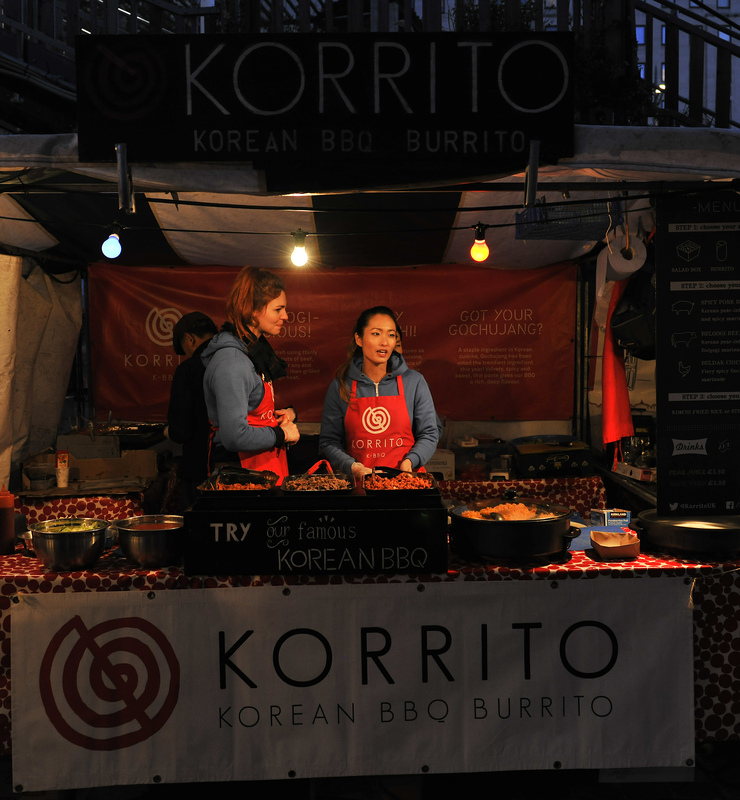 Apart from bringing Korean food to the hungry people of London, what more do you hope to gain through KORRITO? With fusion food, how do you stay true to the authenticity of Korean food without altering it too much? Whilst growing up in London, apart from your family, what other Korean influences did you have? The immediate Korean influence for me was definitely a maternal one. I had a really close relationship with my grandmother, who visited us regularly from Korea. She was a fabulous cook and we used to joke that she had tastebuds on the ends of her fingertips. She may have been a tiny lady but her cooking was formidable. The way she used to whip up meals full of punch and flavour, had a huge influence for me as child. Watching her cook was something that I aspired to. Also, I grew up in Kingston where New Malden, London’s unofficial ‘Korea Town’, is just a hop skip and jump away. This was another influence growing up. Did you fly back to visit Korea regularly? It was a good six years after we moved to London that we finally travelled back to Korea to visit our family. The trip was definitely the highlight of my childhood. Even the local Korean grocery shop seemed so colourful and alien. I was excited by the sheer amount of sweets, crisps, and biscuits. The phrase, ‘a kid in a sweetshop’ doesn’t even begin to cover how awe-inspired I was. That’s what I love about Korea and other Asian cities- it is such a multi sensory experience when you go. It’s something quite different to the West that really makes me feel alive. I’ve spent some time living in Japan too and I love how colourful and vibrant Asia is. This makes me travel back as regularly as I can. If you had to describe Korean food to a novice using 5 words, what would they be? I would definitely say bold, punchy, rustic, spicy and deep. I like the word rustic for Korean. People think that it implies something less refined and that it carries a negative connotation, but I think quite the opposite. The ingredients can be roughly chopped and thrown in. You can cook it at the table yourself and it’s so immediate. Spicy and Deep are the other words I would use. Its never one dimensional. For example the simplest of things – Kimchi, the first taste and the after taste are so far removed from each other. There are four, five tastes that your tongue experiences. The same can be said of the stews and Korean BBQ. It’s the sharpness of the pickles and the earthiness of the Ssamjang (Thick, spicy dipping paste) that you roll together in a lettuce leaf with a succulent, sweet piece of meat and you experience all these different flavours at once. It’s definitely a multi-layered experience. Food is very much a daily part of Korean culture, and is even embedded in its greeting, when people ask if you have eaten at any time of the day. What are your thoughts on this? You’re right food is such an important part of the Korean culture. Any excuse and it’s, ‘let’s all go out and eat’ or ‘let’s cook up a feast’. It’s that sense of community that is reflected in the Korean attitude to food. Koreans are very warm people and the act of making and giving out food, is a way of showing their affection. My mum would drive my friends mad by constantly offering them food even when they weren’t hungry. That was her way of expressing love and affection. The act of providing for somebody- it’s such a basic but beautiful thing. There is so much love that goes into Korean food. Why would you say Korean food has not gained in popularity up until now unlike its Asian counterparts like Chinese and Japanese food? Historically, Korea is a very homogenous country. We even went through a period of self-imposed seclusion during the Chosun dynstasy where we didn’t allow any foreign influences into the country. This resulted in a fierce patriotism but also a reluctance to embrace foreign influences. I think this mentality still lives on to some degree and may have been a reason for Korean food and culture remaining closed off. These are my personal opinions of course and things are definitely different now. Also, if you look at the Korean community in London, the first restaurants that existed were very much targeted at Korean expats, businessmen and students. The first places that really started to cater to Western tastes and thoughts in not just their approach to food but the décor, were the likes of Koba and Kimchee. So, until quite recently, I think the Korean food scene had been inaccessible and a little alien to the average Londoner. Timing is also key and I believe London had to experience a few other Asian cuisines first. 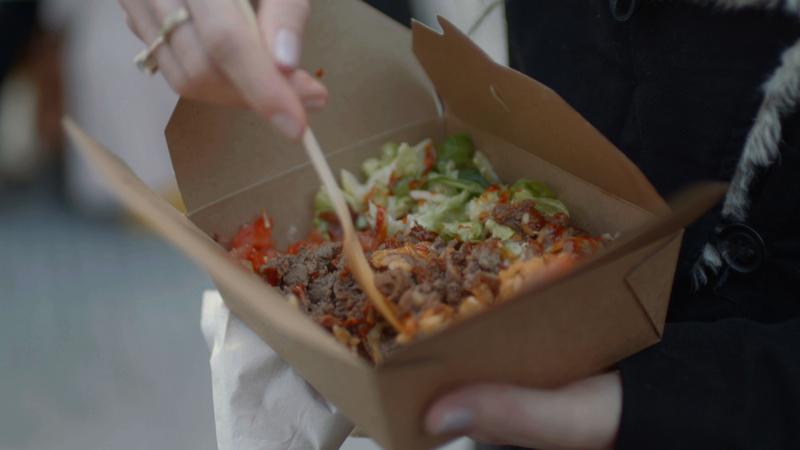 There is all this hype about Korean food at the moment and I honestly think it has a lot to do with the rise in London’s street food scene. This goes hand in hand with youth culture and social media. You are able to eat a wide variety of food, talk with the vendors, snap photos, share on social media. The street food scene has really helped elevate Korean food to a wider audience. What is the difference between the Restaurant and food stall experience? The restaurant environment lends itself well to a formal occasion. You decide to go and meet with a friend, you set a time and place, and sometimes you have to make a reservation. The beauty of the street food scene is the lack of formality, and the creativity and flexibility it provides. You can just stumble across it or happen to walk past it, or you can nip out quickly during your lunch hour. In the purest sense, street food is so accessible. Apart from Korean food what other nation’s cuisine do you love? I am obsessed with Vietnamese food. I love the freshness of coriander, mint, basil, the grilled bbq meat and Pho. My favourite place is City Caphe run by Julie Vu, who incidentally went to the same school as I did! Everything on her menu is to die for. In fact, I’ve been known to order 2 lunches there on many occasions! What is the secret to globalising Korean food? The secret is to carry on as we’re doing in London. 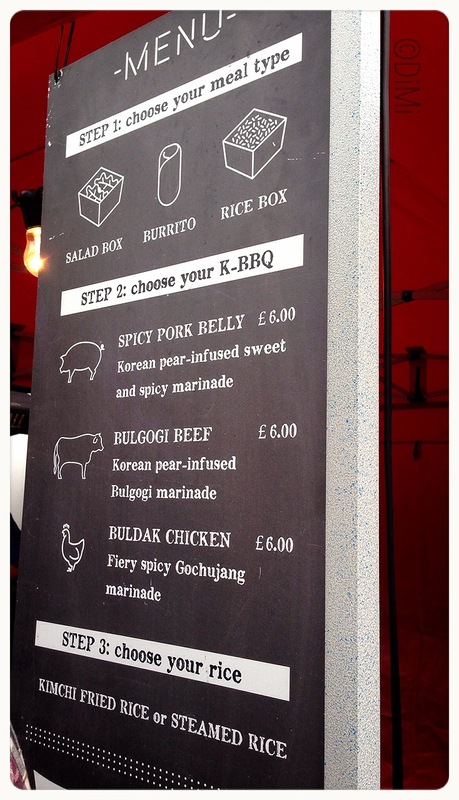 I think London presents a new and interesting opportunity to help globalise Korean food. By turning to individuals who have been inspired by Korean cuisine and culture such as chefs Gizzi Erskine, Neil Rankin and Jordan Bourke, we can help make Korean food more accessible. Then there are the second generation Koreans, like myself and Dan Suh, Managing Director at Korea foods who have experience of both cultures. It’s about embracing these cultures and being open to new ideas. Maybe the purist of Koreans will say, ‘Why on earth is Gizzi putting Sririacha on her Korean fried chicken?’ My answer to them would be, firstly, her KFC tastes amazing and secondly, she is taking Korean food, making it her own and letting more people know about it so it can only be a good thing. Its great that we have Korean government entities in place to help assist in promoting Korean food on a global scale but I would like to encourage the Korean Government to collaborate with the individuals outside of Korea that are really feeling empowered to put Korean food on the map. What has been the feedback on the documentary so far? A lot of people have commented on how beautifully shot it is and how it is equally informative as it is entertaining. We managed to get that balance right. When you say you’re filming a documentary people tend to think it will be informative but not necessarily entertaining. To the credit of Cinematographer Adam Hobbs, he succeeded in making it truly beautiful, almost in the style of a feature film. The way that different scenes are set out, some of it is very dramatic and I think that helps in engaging the viewer. The response has been really positive so far, especially from people who are already familiar with Korean culture. Where I would like for it to get to next is for people who don’t know about Korea to watch it and discover it through the documentary. What are you next scheduled events for Korrito? We are excited and privileged to be a part of ‘The Feast Collective’ at Camp Bestival from the 31st July to 3rd August in Dorset. We were handpicked to represent the countries most creative food makers, bringing together the ultimate outdoor feasting experience. There’s a real focus on sharing big plates, sitting along communal tables, which is what Korean food is all about. We will of course be at our permanent home at the Southbank’s Real Food Market every Friday to Sunday. I am also pleased to announce my childhood home Kingston-Upon-Thames have just welcomed us as a permanent trader at their newly developed Ancient Market. We will be bringing K-Town to Kingston 7 days a week. 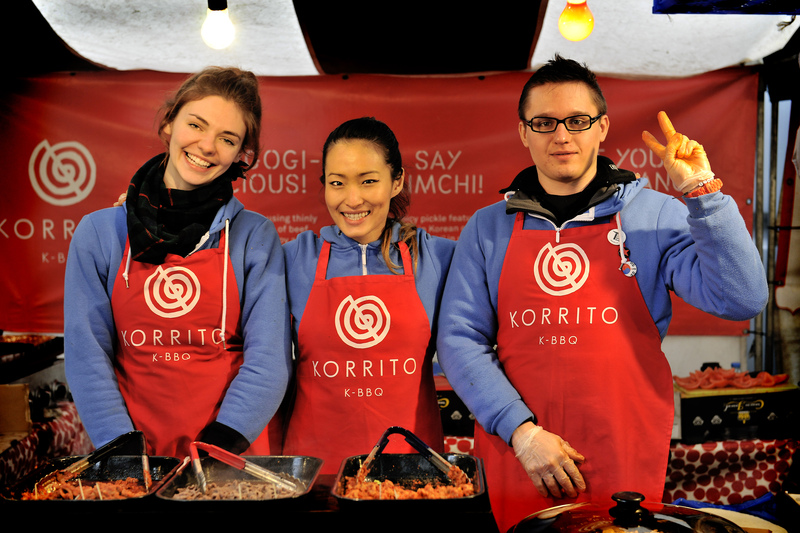 However without giving too much away, KORRITO will also be popping up in a new London location! We’re working really hard on a new evening menu, including tasty Korean cocktails so watch this space. It was such a wonderful experience to talk to Joo about her aims and passion for KORRITO and more importantly Korean culture. We wish her and the team the very best of luck. Now I don’t know about you, all this talk of food is making me hungry. I will need to pop down to Kingston-Upon-Thames and stuff my face with a Burrito and stat! Unless it happens to be a Friday, Saturday or Sunday and you are nearer to Southbank..!